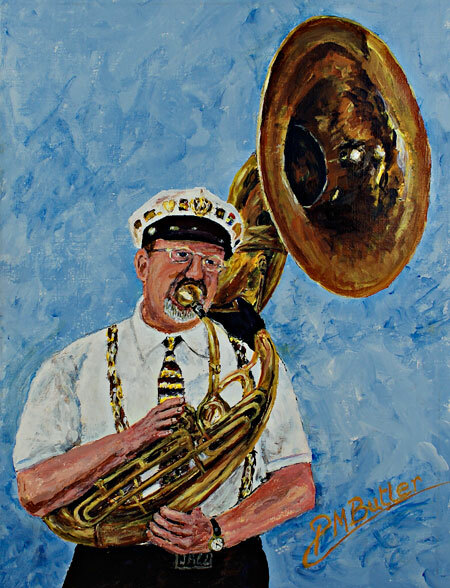 Jazz Painting of Pete Smith on Sousaphone. Jazz fans at the annual Ken Colyer Autumn Jazz Parade in Hemsby, Norfolk, rejoice in the solidly reassuring presence of Pete in the Umbrella Parades and in the increasingly popular jam sessions. But how many know that besides his beloved sousaphone, he has also worn a chain of office as Mayor of Needham Market in Suffolk! Watch out for Pete. Come New Years’, Summer and Autumn Festivals he is sure to be on parade. A certain winner for his commissioned acrylic jazz portrait. 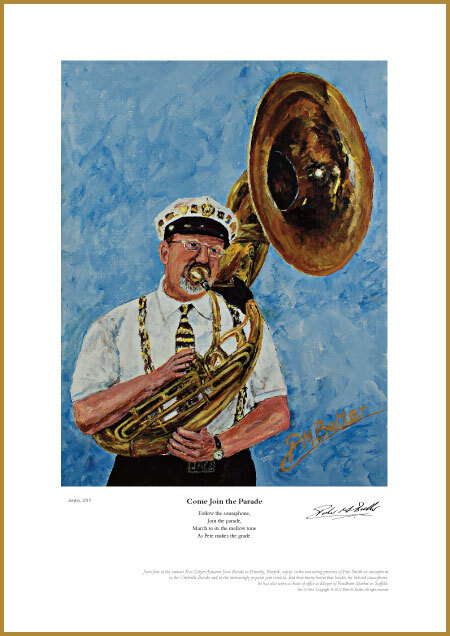 Art & Verse print of the Jazz Portrait of Pete Smith on Sousaphone. As Pete makes the grade. So very, very sorry to learn from the July issue of Just Jazz that Pete passed away on 9th April this year. I shall miss my annual get-togethers with him at the Hemsby Autumn Jazz Parade. He will be sorely missed in the Umbrella Parade Band.